As the popularity of cremation has grown during the past few decades, so too has the number of ways to handle the resultant cremated human remains. This article details 10 unique -- and sometimes unusual -- methods of handling cremated remains for anyone seeking something different versus scattering, whether for their own "ashes" or those of a loved one. Two companies have given new meaning to the phrase, "Going out with a bang." As part of a special memorial service, Angel's Flight will set off a brilliant fireworks display worthy of an Independence Day celebration. 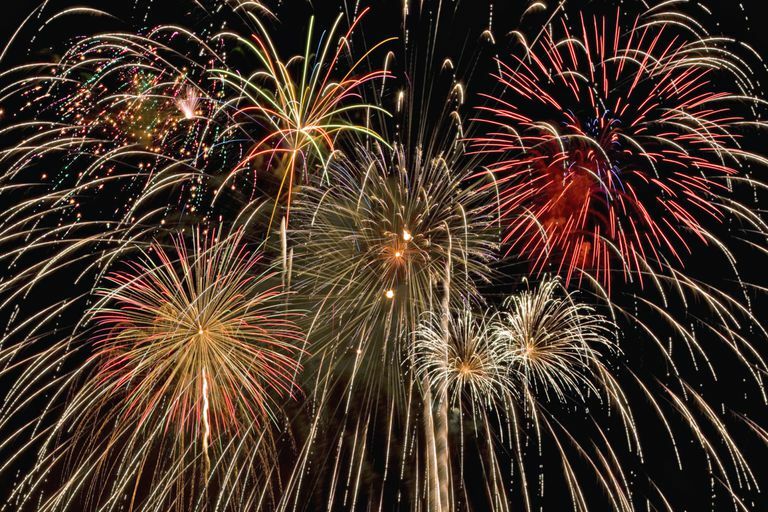 Unlike the rockets fired on July 4, however, these specially made fireworks include a small portion of cremated human remains. Heavens Above Fireworks offers this service for a beloved cremated pet, as well. If the idea of keeping an urn filled with cremated human remains on a fireplace mantle feels cliché, then consider hanging a beautiful, original painting above that space instead. Rest assured, your artwork will be one-of-a-kind because artists today will actually mix your loved one's cremated remains with the paints used to craft each canvas creation. If you'd like to commission a painting, visit Art in Ashes for more information. As Holy Smoke, LLC, states on its website: "Let us help you take your loved one on one more hunt or one more round of clays." Thus, whether the deceased was an avid hunter or shooting-range enthusiast who used a shotgun, rifle or pistol, Holy Smoke will incorporate his or her cremated remains into the appropriate-caliber shell or cartridge for a firearm. The standard price includes your choice of 250 shotgun shells, 100 rifle cartridges, or 125 pistol cartridges. Countless people have asked a tattoo artist to mix cremated human remains with the ink before applying a special memorial tattoo somewhere on their bodies. If you're interested in this form of "living memorial," however, you'll need to do your own legwork. Because of fears concerning how an individual's skin might react with cremated remains, among other things, you won't find providers listed openly in the Yellow Pages. Cremation containers have progressed a great deal since the days of the basic urn-form. Today, it's possible to purchase a cremation container in the shape of almost anything -- even the likeness of President Barack Obama. Perhaps one of the most "useful" urns, however, is the Lifetime Hourglass Cremation Urn, sold by In the Light Urns. As the company's website notes, an hourglass is the "ultimate symbol of the passage of time," and with the actual cremated remains of a loved one serving as the sand in these functional hour glasses, you will probably agree! Coral reefs provide a crucial habitat for marine species, but like many types of environments on the planet, the health of these ecosystems faces numerous challenges, many of them man-made. Fortunately, it is now possible to mix cremated human remains with concrete, form the mixture into "reef balls" and other formations, and then submerge those structures under water for the benefit of all life. Many companies provide these services, including Eternal Reefs, Great Burial Reef, and Ashes on the Sea. Creating unique, beautiful shapes from hand-blown glass takes tremendous skill and practice, but numerous such artists have taken their talents a step further by incorporating a small portion of cremated human remains into their works. The resultant glass orbs, pendants, globes, marbles, spheres, hearts and even oil candles are lovely to behold and will become cherished works of art and memorialization. If this idea appeals to you, you should have little difficulty locating providers, such as Solstice Glass, Memory Glass, and others. You might remember from your high school chemistry class that diamonds form when carbon is subjected to high temperatures and tremendous pressure. And if the lessons you learned in biology class still remain with you, you'll recall that the human body consists of roughly 18% carbon. Thus, companies like Life Gem, Remembrance Diamonds and others can create genuine diamonds from the cremated remains of your loved one. Once created, these diamonds can be set into rings, necklaces, earrings and other types of jewelry. This Urn is "For the Birds"
As noted above, cremation containers no longer conform to the usual "urn form" and can also serve practical uses. Cremation Solutions and Mainely Urns and Memorials, among others, offer great examples of this with their wood and ceramic birdhouse-urn collections. Perfectly suited to housing cremated human remains, once scattered, these empty birdhouse urns can provide shelter for our feathered friends, whose ability to soar skyward often evokes contemplation of our earthly bonds and the division between life and death. Human beings have probably felt the urge to travel into space for nearly as long as primitive peoples have gazed at the stars and the night sky. Ever since Celestis launched the cremated remains of Star Trek creator Gene Roddenberry and 23 others into space in April 1997 on its inaugural flight, the concept has captivated people worldwide. With services that carry "a symbolic portion of cremated remains to space", it is easy to understand the appeal. Who wouldn't want his or her earthly remains to venture into the final frontier!